Attack resistant door, frame & hardware assemblies delay or thwart an attacker’s efforts to enter a classroom. Now, new features provide additional opportunities for school districts to improve classroom security. In-swing capabilities and fire-rated options meet (or exceed) 5-aa10 test standards, making attack resistant openings viable for more schools. Attack resistant openings meet important building codes related to fire & egress and are less costly than bullet resistant options. They keep an armed intruder out of a classroom long enough for occupants to take cover and for first responders to arrive on scene. As the intruder tries and fails to enter multiple rooms in a short period of time, a tragedy is averted. This category of products began with a complete out-swing door, frame & hardware assembly for new construction or full-replacement openings. Retrofit options were subsequently added. 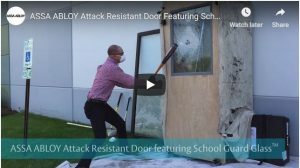 Now, all attack resistant options are available with an in-swing application where a door opens into a classroom or other space off a corridor. 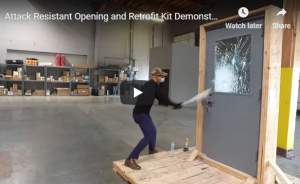 This video demonstrates how new construction and retrofit options withstand a brutal attack by gunfire and a heavy blunt object. If fire rated is a requirement, the complete in-swing or out-swing assembly can include 20, 45, 60 and 90 minute fire rated options for doors, sidelights and borrowed light frames. Learn more about fire rated inclusions here: Ceco Door, Curries, Fleming. See who wins the battle of man vs. retrofitted opening! Overview of attack resistant solutions by Ceco Door, Curries, Fleming. See Security Glass or Films: Make an Informed Decision on Security Upgrades for Your School and What’s the Difference? : Attack Resistant and Forced Entry Bullet Resistant (FEBR) Openings to learn more about differences between solutions.